Recently, our good friend Richard Taylor, provided us with some stunning 3D (stereoscopic) images of television's the Adventures of Superman. This time for your playful enjoyment, Richard has designed a 3D encounter of another kind. 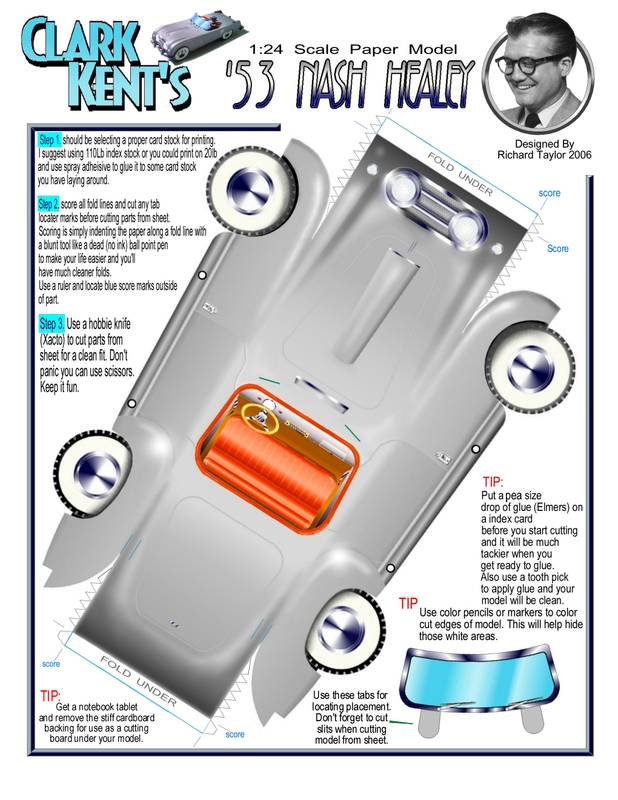 With a careful use of scissors or exacto knife (parental guidance is required) and review of the assembly instructions, you can have your very own 1953 Nash-Healy sportscar to place on your shelf or display cabinet. Adventures of Superman fans have come to know and love this car as it was showcased in several episodes starting in season two. Who doesn't get excited as Clark Kent enters a scene in this car! With it, he scoops Lois Lane and her Nash-Rambler out of every late-breaking news story. It's obvious to us that Clark, especially when behind the wheel of this beauty, isn't always so mild mannered. Watch episodes "The Dog Who Knew Superman", The Man Who Could Read Minds", King for A Day" and Clark Kent Outlaw" for Nash-Healey Sportscar sightings. Page two comes with Mr. Clark Kent himself ready to sit behind the wheel. Enjoy your new toy, but be careful going around those turns. This beautiful reproduction is brought to you by The Adventures Continue. Thanks again Rich, as I'm certain you've made a mere million loyal followers very happy. (For printing purposes, place your curser over the image, right click on your mouse control, save image to your hard drive. From there print onto glossy photo quality paper).